I was originally just going to write about DVMRP, but I’ve also decided to post some basic examples for setting up PIM-SM. I’ll break this post into two parts; first part will look at utilizing DVMRP to setup a simple Multicast domain on a single switch while the second part will look at utilizing PIM-SM across multiple switches. We have a few Nortel Contact Center (formerly Symposium) installations deployed throughout the organization. The Nortel Agent Desktop Display (ADD) utilizes multicast to distribute the information between the server and the individual clients. Unless the clients are in the same VLAN as the server (Application/Web server and Database server) you’re going to need a Multicast Routing Protocol to facilitate the multicast communications between VLANs. I should point out that at this point I’m only talking about making multicast traffic available between VLANs on a single Nortel Ethernet Routing Switch 8600. Unfortunately I didn’t have a spare Contact Center server to test with so I needed to figure out how I could test multicast traffic ahead of time and then just schedule any changes that needed to be made to facilitate inter-VLAN multicast communications. I recalled that VideoLAN – VLC media player could stream audio/video via multicast. In order to test I setup two laptops running Windows XP Service Pack 2, laptop A (10.1.55.50/24) on VLAN 55 (10.1.55.0/24) and laptop B (10.1.56.50/24) on VLAN 56 (10.1.56.0/24). Laptop A will be the broadcast server and stream the video while laptop B will be the client. Click File -> Open File to bring up the Open dialog box. Click on the Browse button to bring up a standard Windows file selection box. Select the file you want to play. Then click Open. Your selection should appear in the text box next to the Browse button. Click the check box for Stream Output and then click the button Settings. If you wish to view the video on the source laptop then check the box next to Play Locally under Output Methods. When streaming to another system you don’t have to play the file on the server, but you can use this option to visually confirm that our video is playing properly before trying to access the stream from another computer. Check the box marked UDP and type in the Muticast address you want to stream the file to. You should use a local-scope multicast address between 239.0.0.0 – 239.255.255.255. You should also make sure that the Time-To-Live (TTL) is set to 2. Then click OK. The file is ready to play so click OK in the Open dialog box too. The video or audio file should begin playing on the computer. The last thing to do before switching to the second laptop is to turn on VLC’s web interface by clicking Settings -> Add Interface -> Web Interface. This will help provide remote control over VLC if we should need it from the second laptop. Open VLC on the second laptop. 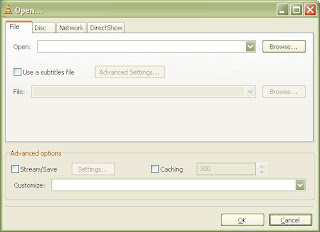 Click on File -> Open Network Stream. Select UDP/RTP Multicast and use the same Multicast address you use on the server. Click the OK button and VLC will start playing your stream. Now that the stream is successfully playing on your computer you can open up a web browser to control VLC remotely. Type http://10.1.55.10:8080/ into the address bar. The web browser will present you with all of the controls you need to manage playlists and playback remotely. If you’ve setup the ERS8600 properly your video should start playing on the client laptop. If you want to make sure that VLC is configured and working properly move both laptops to the same VLAN. If the video stream works then you know that VLC is working properly and you need to focus the network configuration. Note: Windows XP defaults to IGMP v3 which is fine for this test. You can use the following commands to troubleshoot the network pieces. In the examples below I had the laptops connected to an ERS 5520 switch which was uplink on port 1/1. That is why the port is reported as 1/1 throughout the different commands. Hopefully I haven’t gone over the top on this one. Please post any comments, corrections or suggestions. I also need to start focusing on multicast and Symposium so this is great timing. Its really great you make the time to show us the cli commands. Just dialed in to my PP8600 and did a show igmp cache. Turns out I have a few machines multicasting I didn’t even know about. Thanks for sharing. Not really many people out there with knowledge about Nortel … this blog have for a while been ranking in my top 5. Nortel has an internal program called MC Hammer (multicast Hammer) which is VERY useful, I’m sure a CSR can hand it out to you. Good read, will be sure to come back for another look. Thanks for the comment Thom! I have been meaning to try and clean up the formatting of this post. It got all messed up when it was imported from Blogger. Perhaps I’ll try and get around to that soon! Unfortunately DVMRP is not yet available (and may never be) for the ERS 8300 switch. You’ll need to use PIM-SM to facilitate inter-VLAN multicast traffic. I would suggest you look at the second article I posted on this topic titled Multicast Routing Protocol (Part 2). In that article I discuss how to configure PIM to communicate across multiple switches although it can also be used to communicate across VLANs in a single switch. If you follow the guide (syntax might be a little different on the ERS 8300) you should be fairly successful. As I suggested in this article you can use VLC to test your multicast configuration ahead of time so you don’t impact you production Contact Center environment. If you believe the configuration is correct you might also need to look into the IGMP configuration. You may need to disable IGMP within the VLANs you’ll be working with or on the edge switches that you might be touching. Have a two part question, when configuring an 8600 core running IST and SMLT to the edges (5510 and 5520), by default is multicast running across the IST. I ask as I seem to be experiencing problem with CCMA and CCMS and multicast, well at least there is a perception that is a multicast problem. I have pim running global on the 8600’s and enabled on the vlans also. On the edge I’ve enable igmp also. Is there a standard way to set up your 8600 and 5500 when using CCMA and CCMS? I’m not a voice guy and need to get to bottom of a issue that’s happening in regard to resilience testing for CCMA and CCMS.Where the CCMA and CCMS are connected to a 5500 SMLT’d to two 8600. I’ve read in other sites that there appeared to be a problem with SMLT, IST and CC6 do you know if this is the case. Yes, you can have multicast running across the IST. Nortel’s Contact Center (CCMA/CCMS) using multicast for a few different things. The important thing to remember here is that it’s just multicast. The configuration is not specific to CCMA/CCMS but works for all multicast applications in general. The only thing specific to CCMA/CCMS is the multicast address it’s using. You’ll need to define that with your ERS8600 configuration as a RP if your using PIM-SM. I’m not sure if you are aware but you could just through all the clients/servers in the same VLAN, disable IGMP and you wouldn’t need to-do anything else to get everything working. Anyways there’s quite a bit of information available on Nortel’s website that should be of help. I’ve included a link below to the support topologies and interoperability that tells you exactly what designs are supported with regard to SMLT. Thanks for such a prompt response , i think what i really need to know by default will mulicast pass accross the IST. Or what has to be done to allow mulicast go across. Have you come across any problem running SMLT, IST and CC6 as i read on other sites that some people had been experiencing problems , do you know of any. As the problem i’m having is driving me mad. Thanks for help and really find your site so useful. What is the procedure to configure multicast on a VLAN where the Server and Clients reside in the same VLAN. I have one ERS 8600 with 15 ERS 4500 Series switches. This setup is for IPTV in a Hotel environment. Please help out on this. Assuming that you have IGMP disabled on all switches, there’s nothing to-do. The Multicast frames will be flooded out to all ports in the VLAN. Great piece. Could you tell me if every switch ( we have three switches core+edge+edge) has to have igmp and ip pim enabled for this to work ? The later versions of vlc player does not allow you to specify udp alone. You have to do it with rtp ( which i am heard of but not famialiar with ). We have HP switches and while they are good for normal ip traffic, when it gets to more complicaed stuff like this, the documentation is thin on the gound. Thanks for any follow up comments. You only need PIM on your border routers and IGMP on your edge/distribution switches. You can start your testing with IGMP disabled, in this configuration Multicast traffic will be flooded out to all ports in the VLAN. Once you have everything working you can work on enabling IGMP so only ports that are a member are participating in the Multicast traffic will be flooded. I download and run VLC player but could not find such multicast options like your screen shots. Is that because of the new version of VLC ? Which version do you use? I wrote that article back in 2008 so I’m not sure how the options have changed in VLC, although they probably have as you allude to. I need the nortel multicast hammer and I can no longer download. you have a link that I could pass. Thank you. I’ll see if I still have a copy around somewhere… give me a day or two. I’ve found the MC Hammer, if you need it let me know that I put on 4shared. Thank you. I need MC Hammer software and I cannot find it anywhere on the web. Can you please send me a link where to download it. I put the software on the link below, no password is required for you. Thank you for your quick response and help! Do you have similar steps for a Cisco 2960 series switch?